Over 400 people were in attendance on Saturday, May 6th for the Lachine Hospital Foundation’s Gastronomic Evening with Europea Restaurant founder and Grand Chef Jérôme Ferrer. 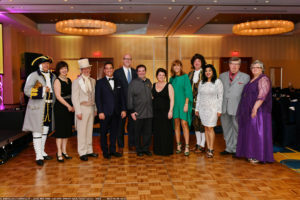 The event which was hosted by Chantal Lacroix from Canal Vie was by all accounts a resounding success and raised a net profit of $100,000 which will go towards the purchase of new medical equipment for the hospital. Guests were treated to a 5-course gourmet meal that was prepared in tandem with Chef Ferrer and Chef Louis Rodaros of the Marriott In-Terminal Hotel in Dorval. 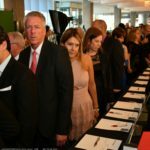 A live band had people up and dancing in between visits to the silent auction table which featured unique gifts such as a two-night stay at the Chateau Frontenac and a round of golf at the Royal Montreal Golf Club. One lucky raffle winner walked away with a $5,000.00 travel voucher to the destination of his choice. 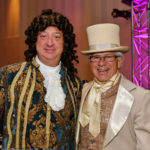 The event put the spotlight on the 350th anniversary of Lachine and the 125th anniversary of Dorval and to mark the occasion, respective mayors Claude Dauphin and Edgar Rouleau were dressed in period costumes, to the delight of the guests. 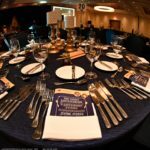 ‘‘We are extremely happy with the success of our event, and wish to thank our sponsors and guests who came out in great numbers to support the Foundation,” said Jacques Filion, chairman of the Lachine Hospital Foundation Board of Directors. “With the provincial government’s commitment to modernize and revitalize the Lachine Hospital, the funds raised tonight will go towards the Foundation’s ongoing mission to provide the best care possible to patients through the purchase of specialized medical equipment and upgrades to the hospital. The Foundation is grateful to all who supported the event, in particular the Prestige level sponsors, Aboud Georges Jean Coutu Lachine, Le Groupe Maurice, Les Auxiliaires bénévoles de l’Hôpital de Lachine and Spinelli. Click here to see and download the photos of the event.